Respondents on the 2016 POD Membership Survey indicated a strong need for learning center management and leadership skills. This session, facilitated by four center directors from very different institutions, responds to this need. Session participants will examine: 1) management and leadership responsibilities, especially in the context of continual change; 2) strategic alignment of the center’s work with institutional mission; and 3) evaluation of center work and demonstration of impact. Participants will leave with an individualized professional development plan, practical tools, and guiding questions that enable them to seek out relevant sessions and colleagues during the conference. In this workshop, we explore powerful model (Symposium) for engaging faculty in campus initiatives and supporting them to take a more active role in leading during times of change. We have successfully used symposium to broaden faculty participation in change initiatives, connecting this work to what matters most to faculty and providing avenues for more inclusive collaboration across disciplines and divisions. Much of the workshop will be devoted to helping participants (1) identify areas where they can lead change on their campuses and (2) develop a draft plan for using symposium to increase faculty engagement in these efforts. Conference program available in PDF and upub format, so I can have it on my laptop and on my mobile device: diminishes the necessity to carry and pull constantly a paper stack. 1:00 – 5:00 PM excursion to Carnegie Mellon – Learning Spaces. LRS interest in Learning Commons. Linda Shadiow, Connecting Reflection and Growth: Engaging Faculty Stories. This workshop seems attractive to me, since it coincides with my firm conviction that SCSU faculty must share “best practices” as part of the effort to engage them into learning new technologies. Kenyon, Kimberly et al, Risky Business: Strategic Planning and Your Center. This workshop might be attractive for Lalita and Mark Vargas, since strategic planning is considered right now at LRS and CETL might also benefit from such ideas. triangulating research findings. student-centered pedagogy. which teaching practices are effective in promoting student-center learning practices. no statistical differences in terms of student learning outcomes between part-time and full-time faculty. The literature says otherwise, but Laura did not find any statistical difference. in terms of discussions, there is huge difference between doing discussion and doing it well. there are gender differences. women more likely to use class discussions, cooperative learning same, students presentations same. gender discipline holds the gender differences. same also in STEM fields. students evaluations of each other work. cooperative learning: it is closer gender-wise. the more student-centered pedagogy, the less disengagement from school work. understand on a national level what students are exposed to. model 2: around instructional technology. More and more CETL into a combined comprehensive center. about 9 are paid by IT and 11 by academic center. because of finances cuts this is the model predicted from the 90s. Why not IT? because ater they say how to use it. and how to use it effective. think outside of technology, technogogy is not the same as technology. Teacher-scholar model: research, service, teaching. egallery and other electronic ways to recognize productivity. Stats and survey software does NOT reside with grad studies, but with CETL, so CETL can help faculty from a glimmer of an idea to presentation and publication. Research Support Specialist. how and where it fits into faculty development. Neutrality. Should CETL be advocates for institutional, organizational change. Do CETL encourage faculty to take innovation and risk (change the culture of higher ed). 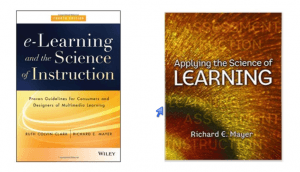 Tenure and promotion: do we advocate that epub should count, e.g. a blog will count toward tenure. we domenstrate that it is good school. scholarship of teaching will be good teaching. OER? Open educational resources. SHould CETL host and participate in those? 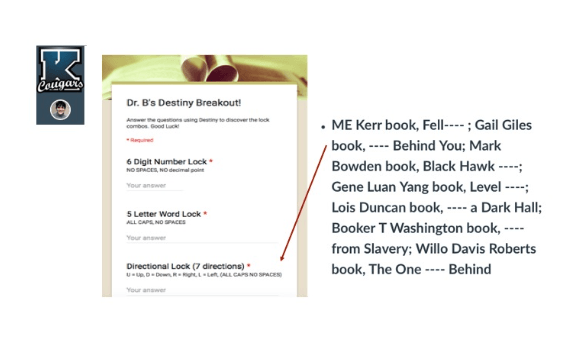 Do we participate in creating resources, which are designed to replace texbooks? Caroline has a state-wide grant to support faculty developing learning resources. Academic Social Media academic.edu and electronic journals. CETL is the comprehensive center, the hub where people go to, so CETL can direct them to and or get together stakeholder to make things happen. the lesson from this session for me is that Lalita and Keith Ewing must work much closer. Evaluating the quality of MOOCs: Is there room for improvement? reflection on “taking” a MOOC and the seven principles. 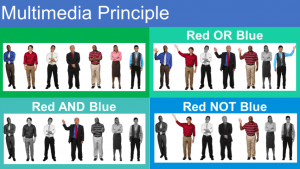 how to design and teach MOOC using the seven principles. MOOC has a lot of issues; this is not the focus, focus is on the instructional design. Both presenters are instructional designers. Danilo is taking MOOC in library and information science. Second principle: what is a good graduate education. about half had completed a course. Atter the 3rd week the motivation is dissipating. Danilo is a librarian. his MOOC class had a blog, gets a certificate at the end. 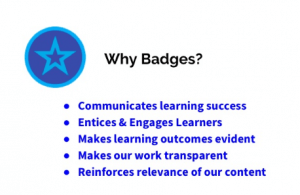 Different from online class is the badges system to get you involved in the courses. the MOOC instructors also had involved grad students to monitor the others. the production team is not usually as transparent as at Corsera. Sustainability. 10 week module, need to do reflections, feedback from peers. 7 assignments are too much for a full-time professional. 1. principle: contact btw faculty and student. Not in a MOOC. video is the only source provides sense of connection. the casual comments the instructor makes addressing the students provides this sense. Quick response. Collaboration and cooperation in MOOC environment and bring it in a F2F and campus teaching. Feedback for quizzes was not helpful to improve, since it i automated. students at the discussion board were the one who helped. from an instructional design point of view, how MOOC design can be improved. group exercise, we were split in groups and rotated sheet among each other to log in response to 7 sheets of paper. then each group had to choose the best of the logged responses. the responses will be on the POD site. Excerpt From: Professional and Organizational Development Network in Higher Education. “POD Network 2013 Conference Program, Pittsburgh PA 11/7 to 11/10.” iBooks. A quantitative study. The difficulty of group works. Various questions from the audience, the time of class (early Mrng) is it a reason to increase the students disengagement. Students pereceptions . The teacher did. It explain why the research and this might have increased the negative perception. Summary of key barrierS. discussoon . How faculty can design and deliver the course to minimize the barriers. Our table thought that there are a lot of unknown parameters to decide and it is good to hear the instructor nit only the researcher. How to deal with dysfunctional group members behaviors. Reflections from the faculty member how to response to the data? Some of the barriers frustrated him. Outlines for the assignments only part of the things he had done to mitigate. What are we asking students on course evaluations. Since a lot more then only negative feedback. Instructor needes more training in conflict resolution and how to run group work. It is a burlesque and theater approach to engage students and faculty into a conversation. 10 plays in 30 min. No videotaping of this performance because the power is in conversation. Is there a franchise, like training people to do that. NSF grant was allowing them but now just pick up the idea. Sell scripts? Can have conversations about strategies how to collaborate with the theater department where to start these short vinniets. If come to campus and bring performance do they do also the follow up. ecrc committee went to their meeting instead of lunch to see if I can particpirate for next year activitities. Ecrc is the acronym for the tech committee. Web site is one takes of this committee. Word press site , how the groups work, how forms work, how to connect with people and most importantly how to start communicating through the web site and cut the listserv. An attempt to centralized all info in the website rather then scattered across universities. purpose – must be part of the syllabus and it must be clear. assessment- initial posting are critical, since it gives and idea what to work on. How much points as part of the bigger picture. Yet it is the ground work for the assignment, which gets most points. how the question is worded and use the threaded discussion for them to reflect how they think, rather then only assess if they read the chapter. The research about online discussion is very different. Online course must must be set up ready before semester starts or not? Curriculum mapping ( see the grid on the. Handout) took much longer then expected. the role of CETL. The provost at Kevin’s institution charged CETL to do the portfolio gig. portfolio must be used by faculty not only students. documenting and learning with eportfolios. faculty to demonstrate reflections to students and how enter into portfolio. Using rubrics. 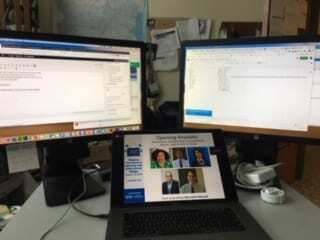 Faculty are using already tools but connecting with. Reflections. how one polish a portfolio before bringing to an Employer. Student Working with career services to polish and proofread. How much the university is responsible for an individual portfolio. How many levels of proof reading. Poor student work reflects a poor faculty attention. the OHIO state UCAT guy is a twitter guy. Program coordinator who manages wordpress and web site. Intersect with FB and twitter. Platforms are inteGrated, so be did not to know the technicalities. The graduate consultants are setting up. ciirdinator tried to understand how the mesh together. Can be used as conversation starters or to broadcast and share info. Use of hashtags how to use them appropriate in twitter and FB to streamline . Scsu problem. W don’t build it they will not come. a Tim burton version of the field of dreams. Rachel CETL assist dir at U of Michigan. She is out there personally likes it. Very static web page. Drupal as a content management system so the blog is part of the web page. So 2 times a week entries. One of the staff people is an editor and writes blog posts, but vetted by a second CETL staff. Auto push for the blog to the twitter. Screencasts for YouTube channel with screencasts. Comments on the blog minimal from faculty and stat. What about students? About 1000 followers on the twitter. What do analytics say. Hits on home page, but no idea how much time reading. The time people spend more time and using the tags . the use of blog is less formal way to share information. recycling in December and August a lot of material. how are u using social media to promote connections. elevate voices of others on campus by interviewing faculty. At U of Michigan there was no interest to learn about what other faculty are doing. So they trashed that initiative but starTed a video narration about faculty who innovate. Videotaped and edited no hi Qual video , tagged and blog posted and this approach created more connection, because it is not text only. What have been the obstacles and indoor failure and what have you learned? one of the panelist has a google spreadsheet which has information of allCETL social media sites There are resources on how to deal with negative outcomes of using social media. Working with librarians, the Norte dame said! they will give you twenty sources. No no, no, he siad, give me your best three. U of MichiGan more grad studns blog guest posts almost no faculty. Have you considered giving them more then guest blog, but no facilitator? Let faculty once a semester do a blog post. It is not moderated but more like lead to how to do a good blog. Interview based approach is unique and does not show up somewhere elSe. Insitutional background important in these decisions. How often refresh the wordpress page. How often one person is voicing and it takes a log of journalistic skills. Use the draft option to publish when there are several ideas coming at once. Mindshift of CETL is to decrease the standards. Make it more informal. Blog post can be always fixed later. To avoid faculty false perception that this is not scholarly needs to be references. So causal tone + references. provost might ask to consolidate prof development opportunities for faculty and students instead of faculty only. If administration is genuine understand transparent Administration more about persuading not listening. Respect, not assuming that faculty will not accept it. If faculty will sacrifices what will faculty see the administration sacrifice on their side. Leading from the. Middle , it means collective vision for the future. Multilevel leadershup, top down efforts dont work and bottom top are fragile. Managing up is less preferred then powering up. It is difficult to tell administration that they miss or misunderstand the technology issue. How to build coalition, different perspectives, aknowledge the inherent conflict. question to students survey, what is most difficult for your and wordle. Make lectures mini. How long mini should be. 22 min, the age number of the person. vygotsky zone of NAND the flipped mindset. http://t.co/vCI8TOJ7J2. Cool tweets at #pod13. Instead of a no-spy deal, the US has begun a Cyber Dialogue with Germany. In a SPIEGEL interview, John Podesta, a special adviser to President Barack Obama, speaks of the balance between alliances and security and says that changes are being made to NSA espionage practices. design thinking: get out from old mental models. new narratives; get out of the sci fi movies. we need machines to make mistakes. Ai even more then traditional software. 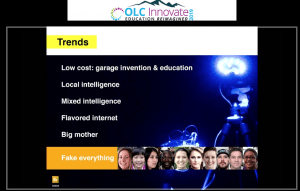 creativity engines – automated creativity. 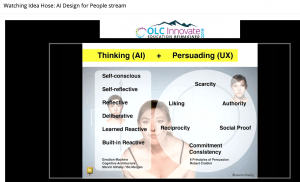 Chatbots, Game Theory, And AI: Adapting Learning For Humans, Or Innovating Humans Out Of The Picture? Brief Abstract:Learning is more effective and organic when we teach through the art of storytelling. 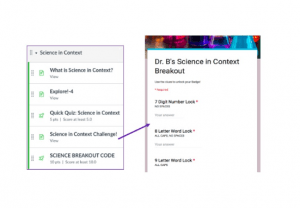 At Strayer University, we are blending the principles story-driven learning with research-based instructional design practices to create engaging learning experiences. This session will provide you with strategies to strategically infuse stories into any lesson, course, or curriculum. qualifications of the embedded librarian: is there any known case for an academic library to employ as embedded librarian a specialist who has both MLIS and terminal degree in a discipline, where he works as embedded librarian. “Embedded librarian” is understood as librarians presence in traditional classroom environments and or through LMS. “Their engagement can be over two or more class sessions, even co-teaching the class in some cases. This model provides in-depth knowledge of student research projects during the research and revision process.” This is for first-year experience students. embedding in departments as a liaison. Kvenild, C., Tumbleson, B. E., Burke, J. J., & Calkins, K. (2016). Embedded librarianship: questions and answers from librarians in the trenches. Library Hi Tech, 34(2), 8-11. Andrews, C. (2014). An Examination of Embedded Librarian Ideas and Practices: A Critical Bibliography. Bobish, G. (2011). 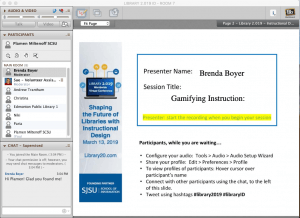 Participation and Pedagogy: Connecting the Social Web to ACRL Learning Outcomes. Journal Of Academic Librarianship, 37(1), 54-63. Cahoy, E. S., & Schroeder, R. (2012). EMBEDDING AFFECTIVE LEARNING OUTCOMES IN LIBRARY INSTRUCTION. Communications In Information Literacy, 6(1), 73-90.
process. My note: And this is exactly what comprise half of my service of. The relatively small amount of research into affective learning, as opposed to cognition, remains true to this day. majority of campuses, behavioral assessment can be problematic. Cha, T., & Hsieh, P. (2009). A Case Study of Faculty Attitudes toward Collaboration with Librarians to Integrate Information Literacy into the Curriculum. (Chinese). Journal Of Educational Media & Library Sciences, 46(4), 441-467. Meanwhile, different attitudes were revealed between teaching higher order thinking skills and lower order thinking skills. Librarian Domain Knowledge, Librarian Professionalism, Curriculum Strategies, and Student Learning were identified as factorial dimensions influencing faculty-librarian collaboration. two major concerns of “Students Learning” and “Librarian Professionalism” from faculty provide insights that understanding pedagogy, enhancing instructional skills and continuing progress in librarian professionalism will contribute to consolidating partnerships when developing course-specific IL programs. p. 199 There is also the concept of the ‘‘blended librarian’’ as described by Bell and Shank (2004) to merge the assets and abilities of a librarian with those of one versed in technology. Academic librarians are obligated and privileged to merge several strengths to meet the needs of their user population. No longer is the traditional passive role acceptable. Bell and Shank (2004) implore academic librarians ‘‘to proactively advance their integration into the teaching and learning process’’ (p. 373). Dewey, B. I. (2004). The Embedded Librarian: Strategic Campus Collaborations. Resource Sharing & Information Networks, 17(1-2), 5-17.
p. 11 librarians and teaching. In 2011, interim dean Ruth Zietlow “gave up” classes after the messy divorce with CIM. the library faculty poled itself to reveal that a significant number of the faculty does NOT want to teach. this library’s social media is imploded in its image. p. 75 Literature about embedded librarianship is so diverse that the definition of this term, as well as related goals and methods when embedding services and programs, can be difficult to define. What are some charateristics of an embedded program? Is embedding only achieved through an online classroom? How did embedded librarianship first begin in academic libraries? p. 76 adopted as a term because it is a similar concept to embedded journalism. Embedded librarian programs often locate librarians involved in the spaces of their users and colleagues, either physically or through technology, in order to become a part of their users’ culture. A librarian’s physical and metaphorical location is often what defines them as embedded. Highly technical tasks, such as creating information architecture, using analytical software, and computer and network systems management were performed by less than 20% of the survey respondents. Shumaker and Talley also report embedded services are often found in tandem with specialized funding. This study also confirms embedded services are not new. In North America, one would be hard-pressed to find a library that does not already electronically embed services into online reference chat, make use of Web 2.0 communication applications such as Twitter and blogs, and embed librarians and collaborators within online classrooms. These are all examples of the embedding process (Ramsay & Kinnie, 2006). The name embedded librarian in this context is a double entendre, as the insertion of widgets and multimedia files into HTML code when designing Web sites is usually called the embedding of the file. Essinger, C. c., & Ke, I. i. (2013). Outreach: What Works?. Collaborative Librarianship, 5(1), 52-58. • Spend more time marketing and reaching out to departments, even though it might mean having less time for other activities. • Find an alternative advocate who can build your reputation through word-ofmouth if your relationship with your assigned department liaison is not fruitful. • Seek opportunities to meet department staff in person. • As much as possible, administrators should commit to keeping liaisons assignments static. p. 57 that faculty outreach is similar to other types of relationship building: it requires time to establish trust, respect and appreciation on both sides. Even a liaison’s challenging first two years can, therefore, be viewed as productive because the relationship is developing in the background. This phenomenon also signals to library administrators the benefits of maintaining a stable workforce. Frequent changes in academic assignments and staff changes can lead to a less engaged user population, and also make the outreach assignment much more frustrating. Heider, K. L. (2010). Ten Tips for Implementing a Successful Embedded Librarian Program. Public Services Quarterly, 6(2-3), 110-121. Hollister, C. V. (2008). Meeting Them where They Are: Library Instruction for Today’s Students in the World Civilizations Course. Public Services Quarterly, 4(1), 15-27. Faculty come to the world civilizations enterprise from a broad range of academic disciplines and world experiences, which has a significant impact on their interpretations of world history, their selections of course materials, their teaching styles, and their expectations for students. Moreover, faculty teach the course on a rotating basis. So, there is no single model of faculty-librarian collaboration that can be applied from section to section, or even from semester to semester. Faculty have widely differing views on the role of library instruction in their sections of the course, and the extent to which library research is required for coursework. They also differ in terms of their ability or willingness to collaborate with the libraries. As a result, student access to library instruction varies from section to section. Kesselman, M. A., & Watstein, S. B. (2009). 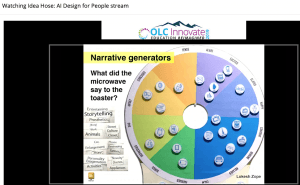 Creating Opportunities: Embedded Librarians. Journal Of Library Administration, 49(3), 383-400.
p. 384 embedded librarians in the blogosphere. not even close to the local idea how blog must be used for library use. p. 389 clinical librarianship – term from the 1970s. p. 390 Special librarians and particularly those in corporate settings tend to be more integrated within the company they serve and are often instrumental in cost-related services such as competitive intelligence, scientific, and patent research. again, this library cannot be farther from the true meaning of Web 2.0 collaboration. Kobzina, N. G. (2010). 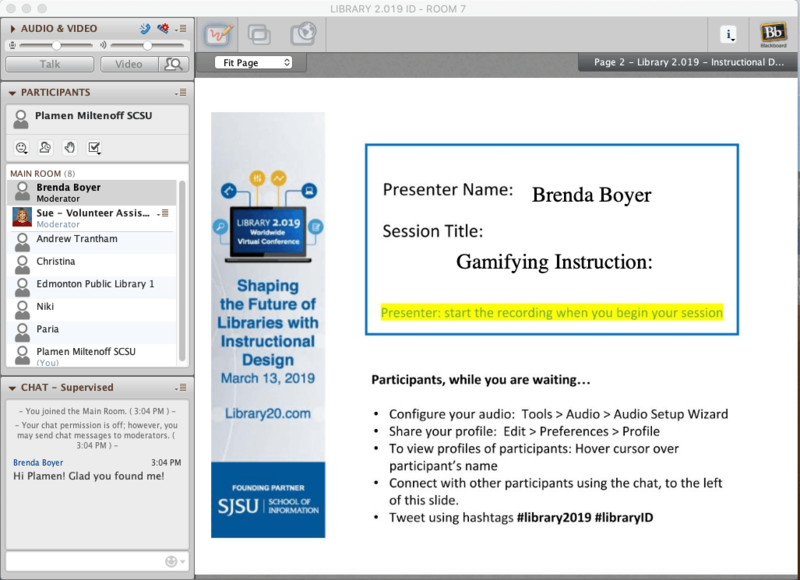 A Faculty—Librarian Partnership: A Unique Opportunity for Course Integration. Journal Of Library Administration, 50(4), 293-314.
my LIB 290 is such class. and I am the only one who is teaching it online by QM standards. Can the administration encourage Global Studies to combine efforts with my LIB 290 and offer a campus-wide class? Lange, J. j., Canuel, R. r., & Fitzgibbons, M. m. (2011). Tailoring information literacy instruction and library services for continuing education. Journal Of Information Literacy, 5(2), 66-80. McGill. p. 77 The McGill University Library’s system-wide liaison model emphasises a disciplinary approach, placing the impetus for outreach and service on individual librarians responsible for particular departments and user groups. Meyer, N. J., & Miller, I. R. (2008). The Library as Service-Learning Partner: A Win-Win Collaboration with Students and Faculty. College & Undergraduate Libraries, 15(4), 399-413. Niles, P. (2011). Meeting the Needs of the 21st Century Student. Community & Junior College Libraries, 17(2), 47-51.
p. 49 The latest technology can be used for communication. Two examples of this modernization process are making podcasts of library lectures and using instant messaging to answer reference queries. Students need Reference Librarians to assist them in focusing their research, showing them appropriate sources and how to use those sources. The change is not how the librarians serve the students but how the service is delivered. Instead of coming to the reference desk Millennial students may choose to use e-mail, cell phones to send a text message or use a chat reference service to communicate with the librarian. Students want to have 24/7 access to library resources and librarians. my note: and yet this library still uses 90ish communication – the facebook page is just an easy to edit web page and the concept of Web 2.0 has not arrived or shaped the current communication. p. 50 Librarians should examine how they present library instruction and ensure that students know why it is important. Further, Lancaster and Stillman state that librarians need to “incorporate some computer-based instruction for Millennials as it allows them to go at their own speed and acknowledges their ability to manage information” (2003, 231). Oakleaf, M., & VanScoy, A. (2010). Instructional Strategies for Digital Reference: Methods to Facilitate Student Learning. Reference & User Services Quarterly, 49(4), 380-390. Rao, S., Cameron, A., & Gaskin-Noel, S. (2009). Embedding General Education Competencies into an Online Information Literacy Course. Journal Of Library Administration, 49(1/2), 59-73.
p. 60 The 3-credit course titled LISC 260—Using Electronic Resources for Research has existed as a required course for this overseas cohort of students since the fall of 1999. The course was initially developed as a required course to introduce the Mercy College Libraries’ resources to this cohort of overseas students. Full-time librarians teach this course as an overload. The course lasts for 8 weeks during fall and spring semesters and is divided into eight modules with five quizzes. Summer sessions are shorter; the summer version of the course runs for 6 weeks. There is no midterm exam, final exam, project, or term paper for this course. Sixty percent of the grade is based on the quizzes and assignments and 40% on discussion and class participation. Critical Thinking Competency This competency was placed in the second module covering the topic “Developing Search Strategies” in the second week of the course. In this module, students are required to select a topic and develop logical terminologies and search strings. This task requires a great deal of critical and analytical thinking and therefore lays the groundwork for the other competencies. The quizzes and assignments for this competency involve breaking or narrowing down the topic into subtopics, comparing two topics or ideas, and similar skills. It is hoped that students will be able to adopt Boolean and other search logic in clear and precise ways in their analyses and interpretations of their topic and use the search strategies they develop for continued assignments throughout the rest of the course. p. 61. Information Literacy Competency The information literacy competency is introduced in the fourth module in the fourth week of the course. As part of the course, students are required to learn about the Mercy College Libraries’ indexes and databases, which this module addresses (“Information Literacy,” n.d.). This seminar course is a library research course with no statistics or mathematics component. Many students enrolled in the course are not mathematics or statistics majors, hence some creativity was needed to evaluate their mathematical and computational skills. Students are given this competency in the fifth module during the fifth week of the course, which deals with subject-specific sources. It was decided that, to assess this competency, a quiz analyzing data obtained in a tabular format from one of the databases subscribed to by the library would fulfill the requirement. Students are given a choice of various countries and related data, and are asked to create some comparative demographic profiles. This approach has worked well because it gives students the opportunity to focus on countries and data that interest them. a pilot project utilizing a variety of methods. p. 158 The concept of embedded librarians is not new, as it has antecedents in branch librarians of the seventies and academic departmental liaisons of the 1980s and 1990s. However, it is a way to proactively reach out to the campus community (Drewes & Hoffman, 2010). p. 160 my note: the authors describe the standard use of LMS for embedded librarianship. p. 163 they managed to fight out and ensure their efforts are “credited.” Assigning credits to embedded librarian activities can be a very tough process. In another study, researchers analyzed bibliographies of students in the course to identify what resources they cited in their research projects. More specifically, they analyzed the type and appropriateness of sources used by the students, their currency, and noting how deeply the students delved into their topics. They also looked at the number of references cited. The authors believed that examining the bibliographies provided an incomplete picture because it provided data on the sources selected by the students but not information on how they retrieved those sources. For this study, the fully embedded librarian is defined as one who is out of the traditional library and into an onsite setting to provide a full range of library services that enable collaboration with researchers or teaching faculty and support student learning. In this model, the embedded librarian is a team member of the RCOP rather than a service provider standing apart. The lines are not blurred as to the kind of services that should be embedded because the embedded librarian is 100% onsite. Very few reports in the literature describe fully embedded librarian models such as this. However, one similar model exists at the Arizona Health Sciences Library (AHSL), which is affiliated with the University of Arizona, where librarians relocated their permanent offices to the colleges of Nursing, Public Health, and Pharmacy. AHSL librarians spent close to 100% of their time in the colleges. p. 144 The embedded librarian has gained recognition in the college and was appointed by the dean to serve on the Instructional Venues Ad Hoc Committee (IVC). My note: This is what Tom Hergert and I have been advocating for years: the role of the librarian is not to find info and teach how to find info ONLY. The role of the librarian is to bring 21st century to School of Education: information literacy is only a fragment of metaliteracies. Information literacy is a 1990s priority. While it is still an important part of librarians goals, digital literacy, visual and media literacy, as well as technology literacy and pedagogical application of technology is imposed as integral part of the work of the mebedded librarian. Another challenge involved the librarian’s decision-making and effective communications skills, especially when deciding to implement library services or programs. Other challenges included speaking the client group’s language and knowing the information needs of each group—faculty, students, staff, postdocs, research assistants, and research scientists—to deliver the right information at the point of need. The following strategies were practiced to overcome these challenges: . A positive attitude can increase connectivity, networking, and collaboration beyond a limited space. Proactively seeking opportunities to participate and get involved in library events, instructional programs, training workshops, or committee work shortened the distance between the remote librarian and those in main campus. .
As video conferencing tools or programs (e.g., Adobe Connnect, Webex, Skype, Google Hangout, Zoom) were the primary means for the remote at 18:19 24 August 2017 librarian to attend library meetings and teach in library instructional programs, spending some time learning to use these tools and embracing them greatly increased the librarian’s capacity to overcome the feelings of disconnection. The willingness to travel several times a year to the main campus to meet librarians face-to-face helped in understanding the system and in getting help that seemed complicated and difficult via remote resources (e.g., computer issues). . Actively listening to the faculty and students during the conversations helped understand their information needs. This served as the basis to initiate any targeted library services and programs. The “What’s in It for Me” (WIIFM) principle1 was a powerful technique to promote embedded library services. The essentials of WIIFM are understanding patron needs and ensuring the marketing effort or communications addressing those needs15—in other words, always telling patrons what is in it for them when promoting library services and resources. Different venues were used to practice WIIFM: . RCOP faculty email list was an effective way to reach out to all the faculty. An email message at the beginning of a semester to the faculty highlighted the embedded librarian’s services. During the semester, the librarian communicated with the faculty on specific resources and services addressing their needs, such as measuring their research impact at the time of their annual evaluation, sharing grant funding resources, and promoting MSL’s resources related to reuse of images. .
Library orientations to new students and new faculty allowed the librarian to focus on who to contact for questions and help, available resources, and ways to access them. . Being a guest speaker for the monthly RCOP departmental faculty meetings provided another opportunity for the librarian to promote services and resources. Casual conversations with faculty, students, researchers, and postdocs in the hallway, at staff luncheons, and at RCOP events helped understand their information needs, which helped the librarian initiate MSL service projects and programs. p. 148 This model would not have been successful without the strong support from MSL leadership team and the RCOP administration. the next step would be to conduct a systematic assessment to get feedback from RCOP administrators, faculty, students, staff, postdocs, and research assistants. The integration of the library instructional program into the RCOP curriculum should be included in RCOP final course evaluations. Another future direction might be to conduct a curriculum map to get a better idea about the learning objectives of each course and to identity information literacy instruction needs across the curriculum. The curriculum mapping might also help better structure library instruction delivery to RCOP. 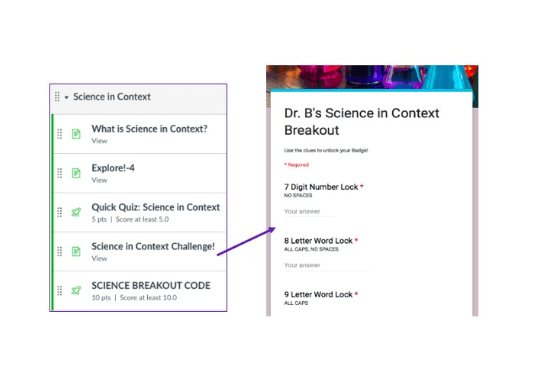 Teaching content might be structured more purposefully and logically sequenced across the curriculum to ensure that what students have learned in one course prepares them for the next ones. The overall satisfaction with services was encouraging, but awareness of the embedded program was low, suggesting an overall need for marketing of services. O’Toole, E., Barham, R., & Monahan, J. (2016). The Impact of Physically Embedded Librarianship on Academic Departments. Portal: Libraries & The Academy, 16(3), 529-556. Agrawal, P. p., & Kumar, A. (2016). Embedded Librarianship and Academic Setup: Going beyond the library stockades. International Journal Of Information Dissemination & Technology, 6(3), 170-173. India. p. 173 as of today, most of the users are not able to differentiate the library professional who have a bachelor degree, Masters degree and who are doctorate of the subject. My note: not in my case and this is my great advantage. Madden, H., & Rasmussen, A. M. (2016). Embedded Librarianship: Einbindung von Wissenschafts- und Informationskompetenz in Schreibkurse / Ein US-amerikanisches Konzept. Bub: Forum Bibliothek Und Information, 68(4), 202-205. Milbourn, A. a. (2013). A Big Picture Approach: Using Embedded Librarianship to Proactively Address the Need for Visual Literacy Instruction in Higher Education. Art Documentation: Bulletin Of The Art Libraries Society Of North America, 32(2), 274-283.
slide 21: domain knowledge through continuous learning, not always through formal degrees. Milbourn, A. (2013). A Big Picture Approach: Using Embedded Librarianship to Proactively Address the Need for Visual Literacy Instruction in Higher Education. Art Documentation: Bulletin Of The Art Libraries Society Of North America, 32(2), 274-283. One of the central issues associated with altmetrics (short for alternative metrics) is the identification of communities engaging with scholarly content on social media (Haustein, Bowman, & Costas, 2015; Neylon, 2014; Tsou, Bowman, Ghazinejad, & Sugimoto, 2015) . It is thus of central importance to understand the uses and users of social media in the context of scholarly communication. most identify the following major categori es: social networking, social bookmarking, blogging, microblogging, wikis , and media and data sharing (Gu & Widén -Wulff, 2011; Rowlands, Nicholas, Russell, Canty, & Watkinson, 2011; Tenopir et al., 2013) . Some also conside r conferencing, collaborative authoring, scheduling and meeting tools (Rowlands et al., 2011) or RSS and online documents (Gu & Widén -Wulff, 2011; Tenopir et al., 2013) as social media. The landscape of social media, as well as that of altmetrics, is constantly changing and boundaries with othe r online platforms and traditional metrics are fuzzy. Many online platforms cannot be easily classified and more traditional metrics , such as downloads and mentions in policy documents , have been referred to as altmetrics due to data pr ovider policies. the Use of social media platforms for by researchers is high — ranging from 75 to 80% in large -scale surveys (Rowlands et al., 2011; Tenopir et al., 2013; Van Eperen & Marincola, 2011) . less than 10% of scholars reported using Twitter (Rowlands et al., 2011) , while 46% used ResearchGate (Van Noorden, 2014) , and more than 55% use d YouTube (Tenopir et al., 2013) —it is necessary to discuss the use of various types of social media separately . Furthermore, there i s a distinction among types of us e, with studies showing higher uses of social media for dissemination, consumption, communication , and promotion (e.g., Arcila -Calderón, Piñuel -Raigada, & Calderín -Cruz, 2013; Van Noorden, 2014) , and fewer instances of use for creation (i.e., using social media to construct scholarship) (British Library et al., 2012; Carpenter, Wetheridge, Tanner, & Smith, 2012; Procter et al., 2010b; Tenopir et al., 2013) . Frequently mentioned social platforms in scholarly communication research include research -specific tools such as Mendeley, Zotero, CiteULike, BibSonomy, and Connotea (now defunct) as well as general tools such as Delicious and Digg (Hammond, Hannay, Lund, & Scott, 2005; Hull, Pettifer, & Kell, 2008; Priem & Hemminger, 2010; Reher & Haustein, 2010) . Social data sharing platforms provide an infrastructure to share various types of scholarly objects —including datasets, software code, figures, presentation slides and videos —and for users to interact with these objects (e.g., comment on, favorite, like , and reuse ). Platforms such as Figshare and SlideShare disseminate scholars’ various types of research outputs such as datasets, figures, infographics, documents, videos, posters , or presentation slides (Enis, 2013) and displays views, likes, and shares by other users (Mas -Bleda et al., 2014) . GitHub provides for uploading and stor ing of software code, which allows users to modify and expand existing code (Dabbish, Stuart, Tsay, & Herbsleb, 2012) , which has been shown to lead to enhanced collaboratio n among developers (Thung, Bissyande, Lo, & Jiang, 2013) . As w ith other social data sharing platforms, usage statistics on the number of view and contributions to a project are provided (Kubilius, 2014) . The registry of research data repositories, re3data.org, ha s indexed more than 1,200 as of May 2015 2 . However, only a few of these repositories (i.e. , Figshare, SlideShare and Github) include social functionalities and have reached a certain level of participation from scholars (e.g., Begel, Bosch, & Storey, 2013; Kubilius, 2014) . A study of UK scholars reports that the majority o f respondents engaged with video for scholarly communication purposes (Tenopir et al., 2013) , yet only 20% have ever created in that genre. Among British PhD students, 17% had used videos and podcasts passively for research, while 8% had actively contributed (British Library et al., 2012) . Technorati, considered t o be on e of the largest ind ex of blogs, deleted their entire blog directory in 2014 3 . Individual blogs are also subject to abrupt cancellations and deletions, making questionable the degree to which blogging meets the permanence criteria of scholarly commu nication (Hank, 2011) . ResearchBlogging.org (RB) — “an aggregator of blog posts referencing peer -reviewed research in a structured manner” (Shema, Bar -Ilan, & Thelwall, 2015, p. 3) — was launched in 2007 and has been a fairly stable structure in the scholarly blogging environment. RB both aggregates and —through the use of the RB icon — credentials scholarly blogs (Shema et al., 2015) . The informality of the genre (Mewburn & Thomson, 2013) and the ability to circumve nt traditional publishing barr iers has led advocates to claim that blogging can invert traditional academic power hierarchies (Walker, 2006) , allow ing people to construct scholarly identities outside of formal institutionalization (Ewins, 2005; Luzón, 2011; Potter, 2012) and democratize the scientific system (Gijón, 2013) . Another positive characteristic of blogs is their “inherently social” nature (Walker, 2006, p. 132) (see also Kjellberg, 2010; Luzón, 2011 ). Scholars have noted the potential for “communal scholarship” (Hendrick, 2012) made by linking and commenting, calling the platform “a new ‘third place’ for academic discourse” (Halavais, 2006, p. 117) . Commenting functionalities were seen as making possible the “shift from public understanding to public engagement with science” (Kouper, 2010, p. 1) . Studies have also provided evidence of high rate s of blogging among certain subpopulations: for example, approximately one -third of German university staff (Pscheida et al., 2013) and one fifth of UK doctoral students use blogs (Carpenter et al., 2012) . while there has been anecdotal evidence of the use of blogs in promotion and tenure (e.g., (Podgor, 2006) the consensus seem s to suggest that most institutions do not value blogging as highly as publishing in traditional outlets, or consider blogging as a measure of service rather than research activity (Hendricks, 2010, para. 30) . most popular microblogs are Twitter (launched in 2006), tumblr (launched in 2007), FriendFeed (launched in 2007 and available in several languages), Plurk (launched in 2008 and popular in Taiwan), and Sina Weibo (launched in 2009 and popular in China). Wikis are collaborative content management platforms enabled by web browsers and embedded markup languages. Wikipedia has been advocated as a replacement for traditional publishing and peer review models (Xia o & Askin, 2012) and pleas have been made to encourage experts to contribute (Rush & Tracy, 2010) . Despite this, contribution rates remain low — likely hindered by the lack of explicit authorship in Wikipedia, a cornerstone of the traditional academic reward system (Black, 2008; Butler, 2008; Callaway, 2010; Whitworth & Friedman, 2009) . Citations to scholarly documents —another critical component in the reward system —are increasingly being found i n Wikiped ia entries (Bould et al., 2014; Park, 2011; Rousidis et al., 2013) , but are no t yet seen as valid impact indicators (Haustein, Peters, Bar -Ilan, et al., 2014) . The altmetrics manifesto (Priem et al., 2010, para. 1) , altmetrics can serve as filters , which “reflect the broad, rapid impact of scholarship in this burgeoning ecosystem”. libraries provide services to support researchers’ use of social media tools and metrics (Lapinski, Piwowar, & Priem, 2013; Rodgers & Barbrow, 2013; Roemer & Borchardt, 2013). One example is Mendeley Institutional Edition, https://www.elsevier.com/solutions/mendeley/Mendeley-Institutional-Edition, which mines Mendeley documents, annotations, and behavior and provides these data to libraries (Galligan & Dyas -Correia, 2013) . Libraries can use them for collection management, in a manner similar to other usage data, such as COUNTER statistics (Galligan & Dyas -Correia, 2013) . – the first goal of this technology instruction is to figure out the current state of technology in K12 settings. * split in groups * using each group member’s information and experience about technology in general and technology in school settings, use the flow chart above and identify any known technology, which can improve the process of each step in the flow chart. * reconvene and compare results among groups. Find similarities and discrepancies and agree on a pool of applicable technology tools and concepts, which can improve the process reflected in the flow chart. Example how to meet the requirements for the first goal: 1. based on your technological proficiency, how can you aid your study using system thinking/systems approach? the work ahead of you is collaborative. What collaborative tools do you know, which can help the team work across time and space? Skype, Google Hangouts for audio/video/desktopsharing. Google Drive/Docs for working on policies and similar text-based documents. e.g., mobile workspaces (http://blog.stcloudstate.edu/ims/2015/12/03/mobile-workspaces-on-campus/ ) are part of the larger picture, namely active learning spaces (http://blog.stcloudstate.edu/ims/?s=learning+spaces&submit=Search), which involves, furniture, building construction, etc. when planning for a new building and determining learning spaces, what is the percentage of importance, which we place on technology, in relation to furniture, for example? how much do teachers have a say in the planning of the building, considering that they had worked and prefer “their type” of learning space? who decides what technology and how? how one rationalizes the equation technology = learning spaces = available finances? how much outsourcing (consulting) on any of the components of the equation above one can afford / consider? How much weight the strategic planning puts on the consulting (outsourcing) versus the internal opinion (staff and administrators)? how “far in the future” your strategic plan is willing / able to look at, in terms of technology – learning spaces? digital humanities (http://blog.stcloudstate.edu/ims/2015/03/27/digital-humanities/; and digital citizenship (http://blog.stcloudstate.edu/ims/2015/10/19/digital-citizenship-info/) – why is it important and how it is important? The influence of 3D printing, adaptive learning technologies and wearable technologies in the classroom is growing. – the second goal of this technology instruction is to become acquainted with future technological trends and developments. What is BDaas, SaaS, PaaS, X-as-a-Service, IaaS versus SAN? Are Schools Wasting Moneys on Computers?